The Blessed Mother of Jesus, who shared every suffering of her Son, had about an hour previously -- when the unjust sentence was pronounced upon Him -- left the forum with John and the holy women to venerate the places consecrated by His cruel Passion. But now when the running crowd, the sounding trumpets, and the approach of the soldiers and Pilate's cavalcade announced the commencement of the bitter Way of the Cross, Mary could no longer remain at a distance. She must behold her Divine Son in His sufferings, and she begged John to take her to some place that Jesus would pass. They left, in consequence, the vicinity of Sion, passed the judgment seat, and went through gates and shady walks which were open just now to the people streaming hither and thither, to the western side of a palace which had an arched gateway on the street into which the procession turned after Jesus' first fall. The palace was the residence of Caiaphas; the house on Sion was his official tribunal. John obtained from the compassionate porter the privilege of passing through and of opening the opposite gate. I was terrified when I saw the Blessed Virgin so pale, her eyes red with weeping, wrapped from head to foot in a bluish-green mantle, trembling and shuddering, going through this house with the holy women, John, and one of the nephews of Joseph of Arimathea. They could already distinguish the tumult and uproar of the approaching multitude only some houses off, the sound of the trumpet and the proclamation at the corners that a criminal was being led to execution. When the servant opened the gate, the noise became more distinct and alarming. Mary was in prayer. She said to John: "Shall I stay to behold it, or shall I hurry away? Oh, how shall I be able to endure it?" John replied: "If thou dost not remain, it will always be to thee a cruel regret." They stepped out under the gateway and looked to the right down the street, which was here somewhat rising, but which became level again at the spot upon which Mary was standing. The procession at this moment may not have been more than eighty paces distant from them. It was preceded by none of the rabble, though they were still following on the side and in the rear. Many of them, as have said, were running through the neighboring street to get other places from which they could obtain a look. And now came on the executioner's servants, insolent and triumphant, with their instruments of torture, at sign of which the Blessed Mother trembled, sobbed, and wrung her hands. One of the men said to the bystanders "Who is that woman in such distress?" And someone answered: "She is the Mother of the Galilean." When the miscreants heard this, they jeered at the sorrowing Mother in words of scorn, pointed at her with the fingers; and one of the base wretches, snatching up the nails intended for the crucifixion, held them up mocking before her face. Wringing her hands, she gazed up at Jesus and, in her anguish, leaned for support against one of the pillars of the gate. She was pale as a corpse, her lips livid. The Pharisees came riding forward, then came the boy with the inscription--and oh! a couple of steps behind him, the Son of God, her own Son, the Holy One, the Redeemer! Tottering, bowed down, His thorn-crowned head painfully bent over to one shoulder on account of the heavy cross He was carrying, Jesus staggered on. The executioners pulled Him forward with the ropes. His face was pale, wounded, and blood-stained, His beard pointed and matted with blood. From His sunken eyes full of blood He cast, from under the tangle and twisted thorns of His crown, frightful to behold, a look full of earnest tenderness upon His afflicted Mother, and for the second time tottered under the weight of the cross and sank on His hands and knees to the ground. The most sorrowful Mother, in vehemence of her love and anguish, saw neither soldiers nor executioners---saw only her beloved, suffering, maltreated Son. Wringing her hands, she sprang over the couple of steps between the gateway and the executioners in advance, and rushing to Jesus, fell on her knees with her arms around Him. I heard, but I know not whether spoken with the lips or in spirit, the words: "My Son!" ---"My Mother!" The executioners insulted and mocked. One of them said: "Woman, what dost thou want here? If thou hadst reared Him better, He would not now be in our hands." I perceived, however, that some of the soldiers were touched. They obliged the Blessed Virgin to retire, but not one of them laid a finger on her. John and the women led her away, and she sank, like one paralyzed in the knees by pain, on one of the cornerstones that supported the wall near the gateway. Her back was turned toward the procession, and her hands came in contact with the obliquely projecting stone upon which she sank. It was a green veined stone. Where Mary's knees touched it, shallow hollow places were left, and where her hands rested, the impression remained. They were not very distinct impressions, but such as might be made by a stroke upon a surface like dough, for the stone was very hard. I saw that, under Bishop James the Less, it was removed into the first Catholic church, the church near the Pool of Bethsaida. As I have before said, I have more than once seen similar impressions in stone made by the touch of holy persons on great and remarkable occasions. This verifies the saying: "It would move the heart of a stone," and this other: "This makes an impression." The Eternal Wisdom, in His mercy, needed not the art of printing in order to leave to posterity a witness to holy things. When the soldiers flanking the procession drove it forward with their lances, John took the Blessed Mother in through the gate, which was then closed. The executioners meanwhile had dragged Our Lord up again, and laid the cross upon His shoulder in another position. 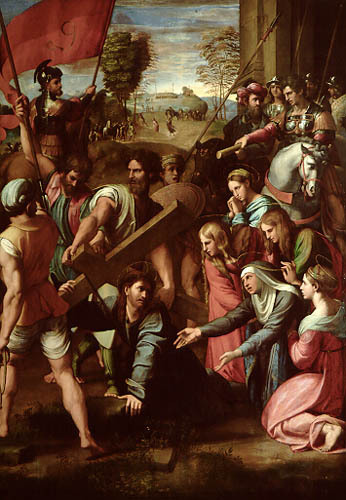 The arms of the cross had become loose from the trunk to which they had at first been bound, and one had slipped down and become entangled in the ropes. Jesus now took them in His arms, and the trunk dragged behind a little more on the ground. Here and there among the rabble following the procession with jeers and laughter, I saw the veiled figures of weeping women moving along with uneven steps.